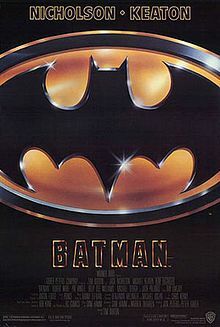 ^ 1.0 1.1 Batman (1989). Box Office Mojo. [2013-05-12]. ^ Batman. Rotten Tomatoes. [2012-07-05]. ^ Batman (1989): Reviews. Metacritic. [2008-05-04]. ^ Archived copy (PDF). [2010-05-21]. （原始内容 (PDF)存档于2012-05-20）. ^ AFI's 100 Years...100 Thrills Nominees (PDF). [2011-08-20]. （原始内容存档 (PDF)于2011-07-06）. ^ AFI's 100 Years...100 Movie Quotes Nominees (PDF). [2011-08-20]. （原始内容存档 (PDF)于2011-07-06）. ^ HollywoodBowlBallot (PDF). [2011-08-20]. （原始内容存档 (PDF)于2011-07-06）. ^ AFI's 10 Top 10 Ballot (PDF). [2011-08-20].